Does any One Know if you can replace the fiber disc in the gear wheel torque limiter..? I found this fiber disc from a triumph on Google. I Know i need to cut it to the right size, but Will it work..? I dont know if anyone has ever tried replacing the fiber disc, there are easier ways to fix the slipping torque limiter. You can either just tack the two rotating parts together with a welder, though I believe it's a bad idea to weld them togetehr, or you can put a shim in to get more pressure on the bevelled washer to stop the torque limiter from slipping. You can buy a kit from Taffmeisters, with a shim and a spring for the one-way clutch, or you can try and find a thin shim somewhere else. There is a thread regarding the slipping torque limiter, with comments on the slipping torque in Newton meters, where it's at on the standard torque limiter, and where it's at after it has been shimmed, or where you need to have it to prevent it from slipping too easy. Read what Taffy wrote in his Wiki about the Torque Limiter. Also called the Starter Freewheel in the Wiki. "This first appears on the 2002 engine and looks like an innocent little wheel ‘merely’ connecting the starter to the sprague bearing. Wrong! It is infact a clutch to stop a violent reversal going through the starter motor and the idea is that it should ‘give way’. Unfortunately it gives way when starting. To check it out, remove and hold in the vice via the large gear, use a torque wrench set on a vert low 12LB/10Nm and if it clicks off its good but if it turns it is worn. Even on 4lb the nut will turn rather than click the torque wrench. Now hold by the small gear and undo the 17mm nut with a 6-sided socket. 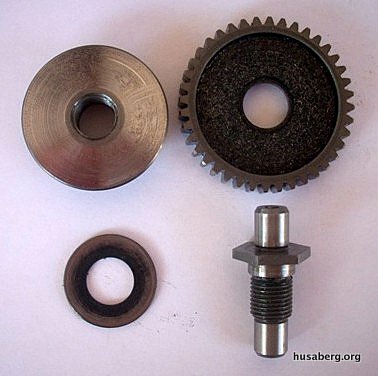 Add a .016″ (0.4mm) shim to the spring washer and it should be cured." In 2001 the Torque Limiter was replaced under warranty as it would not slip and caused clutch basket gear damage if a backfire occurred. In 2004 and other years some bikes were affected by a torque limiter that would slip too easily. BOSS (member) and dealer has also said that the breakaway should occur at 7 to 15 Ft. Lbs. Ned37 (member) said: "when you disassemble the torque limiter, you can put very thin shims in the inside to tighten the "breakaway" tension that keeps your starter from turning over the engine. it is there to provide a safety in case the engine backfires and tries to destroy the starter system. when you take it out, clamp the gear part in a padded vise and turn it with a torque wrench to see at which point it breaks away. iirc, it needs to be around 20 ft lbs?. adding a shim or 2 will increase it. it seems to be a problem in most of the '04 models"
Sparks (member) said: "there is a quick fix on these torque limiters,as for the 11Nm Ausberg I would say it hasn't got much life. The one I took off mine slipped at 5Nm, so when you undo the bolt that holds the two halfs together there is a dished washer all I did was to put a 15 thou shim on first then the dished washer retighten the bolt and voila it now slips at 25Nm, so a simple shim can save you 90 pounds or 180 Dollars." Taffmeisters used to sell the shims and instructions but I don't see them on his web site right now (or perhaps I just can't find them). A few have welded the torque limiter so that no slipping will ever occur. Those of us that were here in 2001 will remember all of the damage that was caused by the Torque Limiter not slipping when it needed to. Last edited by husabutt; October 6th, 2018 at 11:08 AM. ...aaand there you have it. Thanks Husabutt! @husabutt: Nice explanation - well done! The "off-the-shelf" torque limiter was not shimmed to 10Nm, so it was set to 54Nm by default. Obviously enough to destroy the clutch basket! Shimmed correctly everything is fine! I still do the kit lads! it's called 'The Starter Repair Kit' or 'SRK'. We put a stronger garter spring in with two shims and a setb of instructions. 100825 in the shop. BTW everyone, the Doc was put together entirely by myself over 4-5 years. It started as 35 sheets of typed paper and then it grew. it was put into a Wiki form by Maddel and he understood how to add links and photos better than me at the time. nearly everything in it was by me or my idea and if not people got credited with it so the 'default' knowledge was mine and now, I never get mentioned. All i did was say i did it (as in put it together) on the opening page and that was it. Our illustrious leader Zen, has now copied it up and removed my name completely at the beginning so now it doesn't appear at all. I NEEDN'T TELL YOU HOW BETRAYED I FEEL BY THIS. the DOC is a compilation of ideas from site users including Taffy who selected the ideas and then Maddel compiled them. many people wanted to contribute more than ideas but Taffy refused not only ideas and opinions but also their contribution of time and organization. what is the zen philosophy ... its not what you do but how you do it that is key. The Doc is my creation and not "a compilation of ideas from site users including Taffy ..."
I don't believe you'll find anywhere on this site that anyone other than you wanted to contribute but nobody actually stopped you. if you can get rights to change it you're allowed too! how would you bloody know anyway, you weren't there! the fact is, you're so sick in the phuqin head that your views are unsound. things like the SKF mains, your view was the only view. there is only Bushie's view!!! well the SKF mains are just fine, my theory that they are a better main than the NTN still hoolds water. I've had NO SKF mains failures at all. zilch. it could be said about countless things you have said. phuq off to whatever site you ruin now and don't come back. all actual engineers and mechanics who you've pissed off and wouldn't listen too. Taffy has royally fucked this sites diversity by chasing his competitors away. i notice you can't stick to the point fuckwit. its you that got chucked out they couldn't stand you here that's why. mouth like a sewer. anyone who contributed got added full stop AND it was written before we fell out. your contribution is where it deserves to be at phuqall. take your one brain cell and piss off. your so vile that nobidy dare to stop you. people would rather leave than take more of your crap. chase people away? your lies are so bad you start by saying maddell did the doc and then you say maddel wanted to contribute? so which is it dickhead?